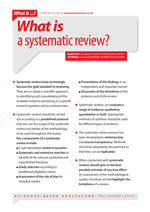 What is a systematic review? | Whatis Series...? Systematic reviews have increasingly become the ‘gold standard’ in reviewing. They aim to adopt a scientific approach to identifying and consolidating all the available evidence pertaining to a specific research question and to minimise bias. Systematic reviews should be carried out according to a predefined protocol that sets out the scope of the systematic review and details of the methodology to be used throughout the review. Discussion of the limitations of the evidence and of the review. Systematic reviews can evaluate a range of evidence; qualitative, quantitative or both. Appropriate methods of synthesis should be used for different types of evidence. The systematic review process has been developed to minimise bias and ensure transparency. Methods should be adequately documented so that they can be replicated. When conducted well, systematic reviews should give us the best possible estimate of any true effect. An assessment of the methodological quality of reviews should highlight the limitations of a review.